A Rain of Frogs > Walls! That, my friends, is a picture of walls. And a ceiling. Last night, actual reconstruction started in our kitchen. All the electrical is done, the plumbing has been updated where it needed to be updated, and all the other little things that needed to be done (roughed in central vac, for example) have been done. Pay no attention to the extra circle beside the kitchen sink drain pipe, or the diagonal crack near the top-left of the door. Accidents happen, okay? 95% of the ceiling is up, barring the edge where we still have to put the vapor barrier up, and the walls have been started. The ceiling is tough, because 5/8” drywall is heavy! 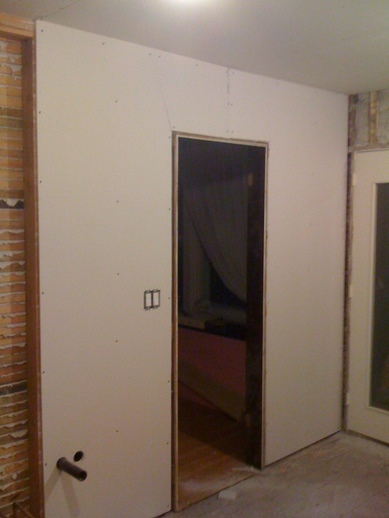 The 1/2” drywall on the walls: a) is lighter, and b) does not need to be hoisted over one’s head. It’s very exciting to see a room turn back into a room!